We are a nonprofit-organization aimed at fostering breakthrough research that make an important difference in the lives of patients and their family members. Our actions are performed at the national and international level. To be patient-centric in their thinking. This is a very promising and innovative approach whereby all parties combine their strength and expertise in a collaborative, dynamic and shared spirit. That is the key driver to achieving transformative, potentially life-saving therapies that can revolutionize the clinical treatment of a disease and offer new life to patients and concerned families. We strive to have a patient-focused drug development. We are committed to advancing progress by transforming the current research into meaningful research and drug development programs. Our major priority is to provide a complete and holistic view of the patient as a person. Our focus is the inclusion of patients and patient advocacy groups as an essential component in the development of successfully clinical programs. The rare disease community is our inspiration. Our core values reflect our capacity to define what needs to be done in order to boost development of therapies that will produce a significant benefit for patients and their family members. Patient-centric, we strive to improve quality of life for patients and family members. Mission-driven, we believe and recognize that patients and family members are the key drivers of our work. Perseverance, we are determined to respond to the needs of the often-neglected rare disease community. Knowledge and creativity, to give voice to the medical, economic and social challenges associated with rare diseases and consequently, speed access to innovative treatments. Fulfillment by making a difference. We are rewarded because our work is consistent with our beliefs and goals. Integrity to coordinate and encourage cooperation and collaboration with the highest ethical standards engendering trust within the rare diseases community. Collaboration, by promoting partnership and mutual respect between main stakeholders to create a critical voice in shaping the efforts towards drug development. Passion for innovation and improvement by including patient support groups as active and essential partners in clinical drug development. We are open to new ideas, and give targeted innovative solutions. 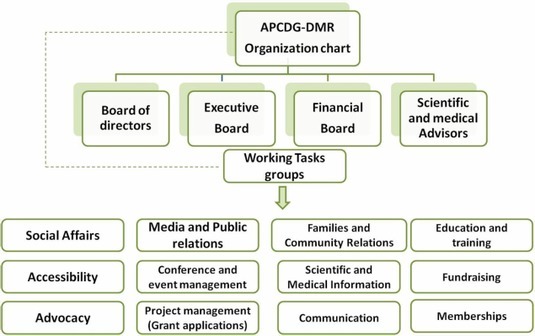 APCDG-DMR is a nonprofit-organization aimed at fostering breakthrough research that makes a difference in the lives of patients and their family members. Our actions are performed at the national and international level. Exceptional individuals are doing tremendous contributions as volunteers to move APCDG mission moving forward. Several working groups have been created across several domains committed to address the concerns of affected families.